Today I have a secret recipe for a delicious pasta dish served at Dave and Buster’s. 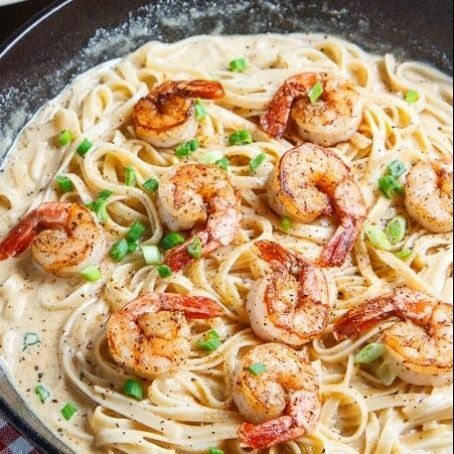 Cajun-infused shrimp with mushrooms and tomatoes in a creamy Alfredo sauce served over fettuccine. Boil pasta per the directions on the package. Toss the shrimp in 1 tablespoon Blackened Poultry Magic seasoning. Heat a skillet and add the olive oil. Add the shrimp that’s been tossed in the seasoning and sauté it for about 1 minute until the shrimp colors – you need to turn it a couple of times. Add the mushrooms and cook with the shrimp for another couple minutes. Add the garlic and stir it around. Add the tomatoes, then toss and cook a few seconds. Add the cream and 1 to 2 tablespoons of the Blackened Poultry Magic seasoning (depending on your taste) and bring it all to a simmer. Add the cheese, egg yolk and green onions if you like them, and toss the lot together over a medium heat until the sauce thickens. Don’t use too high a heat or the egg will curdle and look scrambled. Put the cooked drained pasta in the serving bowl and pour your sauce over it. Garnish with some more cheese, more diced tomatoes and a few more green onions. Chef Paul does not make a Blackened Poultry Magic. He does have a Poultry Magic product.